Jazz pianist Malcolm Campbell draws on classical training--and has an ambitious five-year plan. The epiphany came early. 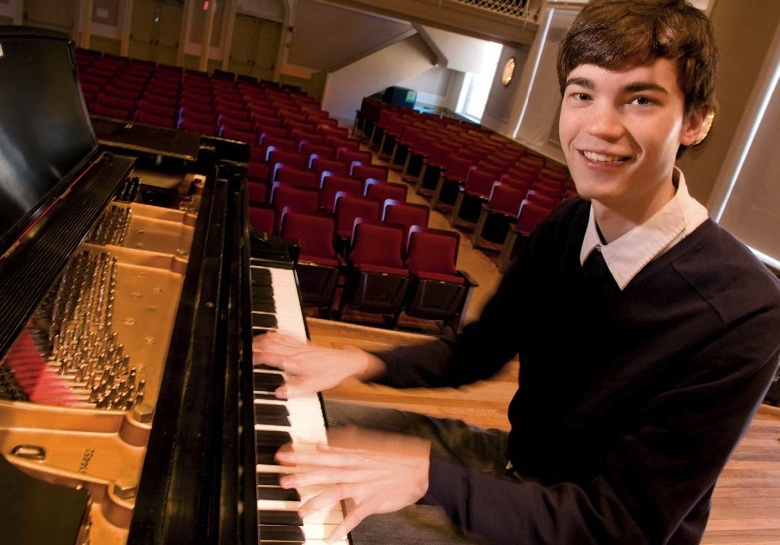 Until middle school, Malcolm Campbell ’10 had been, well, another highly accomplished young pianist--he began learning the instrument at six and received solid classical training. But as a tween, Campbell happened upon three jazz piano recordings that changed his life: Oscar Peterson’s Night Train, Portrait in Jazz by Bill Evans, and Duke Ellington’s Piano Reﬂections. “Those three albums are the reason I’m playing jazz today,” Campbell says. In fact, he’s playing a lot of jazz today, and playing it rather well. The Malcolm Campbell Quartet performs frequently in the Boston area and recently recorded its ﬁrst CD, including four original compositions by Campbell (see www.malcolmcampbellmusic.com). He has played with a New England Conservatory (NEC) combo that jammed with saxophonist Lee Konitz at Boston’s Jordan Hall, and last year he played for Herbie Hancock when the jazz great came to Harvard. Campbell practices three hours a day--and those hours fall inside the curriculum. He is part of the third class to enroll in a ﬁve-year, joint Harvard-NEC program: next year, he expects to earn his A.B. in chemistry and physics from Harvard and the year after, a master’s in music degree from NEC. The Harvard-NEC program was the deciding factor in convincing Campbell to attend Harvard. “I needed to ﬁnd a way of doing music seriously,” he says. “It keeps me in the Boston music scene, and I wouldn’t have met a lot of the people I play with otherwise. Plus, the teachers are at such a high level.” (Campbell has two jazz piano teachers at NEC, Panamanian Danilo Perez and Finn Frank Carlberg.) The musical life hasn’t hurt his work in chemistry and physics, either: Phi Beta Kappa elected Campbell to its Junior Eight this spring. He’s been doing research in the lab of assistant professor of chemistry and chemical biology and of physics Adam Cohen, using physical tools to probe biological systems. When Campbell goes home to Lexington, Massachusetts, there’s another Harvard faculty member present: his father is Olshan professor of economics John Y. Campbell, who also sings and plays clarinet. Campbell’s mother, Susanna, is a psychiatric nurse who plays piano, ﬂute, and harp. (Her father, Malcolm Peyton, for whom Campbell is named, is a classical composer on the NEC faculty.) Older brother Graham, who has Down syndrome, is a serious pianist and a student at Berkshire Hills Music Academy. (In late April, the two brothers played in a concert at Harvard as part of a Down syndrome awareness event.) Younger sister Naomi, 18, has played piano, clarinet, and bassoon, while 11-year-old Sophia sings and plays piano. The family jams together whenever possible.